HOUSTON – (By Michelle Leigh Smith for Realty News Report) – The Meyerland community lost more than homes when Hurricane Harvey hit Houston last year. It lost its H-E-B grocery. 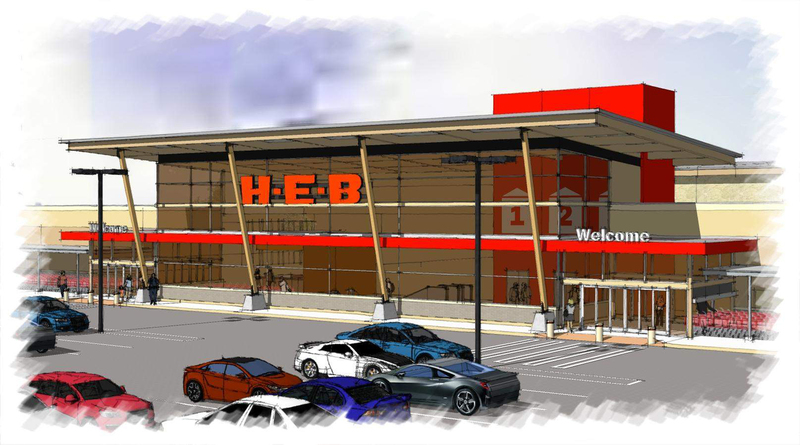 The H-E-B void will be filled in late 2019 when a new, elevated store is completed at Meyerland Plaza, at the corner of Loop 610 and Beechnut in southwest Houston. 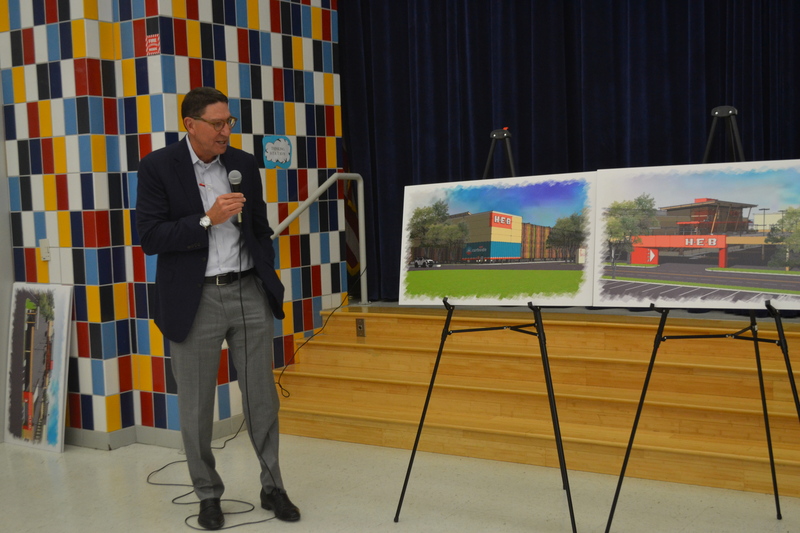 “We can’t build it fast enough,” Scott McClelland, President of H-E-B Houston told a large crowd of Meyerlanders Thursday. His enthusiasm was met with universal applause from a crowd composed of many homeowners who lost their homes in the Meyerland neighborhood where 1,900 of the 2,300 houses suffered heavily at Harvey’s watery hand. Some of them were rescued by boats off of second-story rooftops. H-E-B’s $35 million, 96,000-SF Meyerland Plaza store will have ground-floor parking and on the first floor and a grocery store on the second floor with a skybridge connecting to the second floor of the adjacent JC Penney. The 950,000-SF Meyerland Plaza center is owned by a partnership of Bellaire-based Fidelis Realty Partners, led by Alan Hassenflu, and BlackRock Realty Advisors of New York. 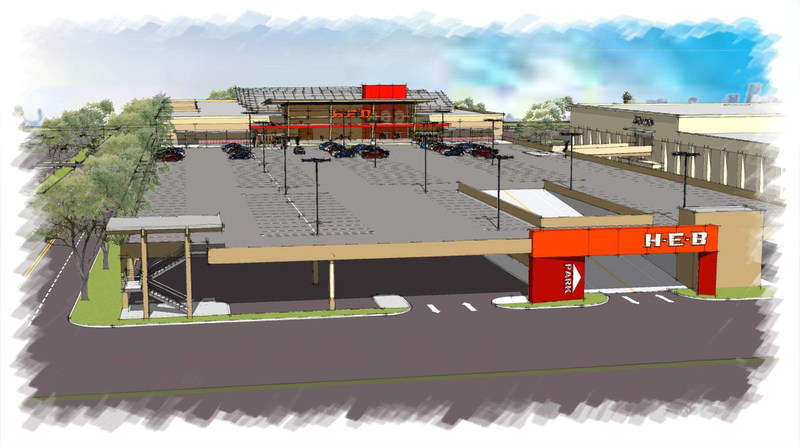 McClelland and Alan Hassenflu, head of Fidelis Realty Partners, shared their plans for a new H-E-B store in Meyerland Plaza. McClelland told the audience of 400+ Meyerlanders that he does not do cookie cutter stores. He showed several drawings of the proposed store, which features ambient natural light streaming in from the roof. “The sunlight warms the overall feel of the store,” he said. “In Houston, we tailor our H-E-Bs aggressively to clientele,” McClelland said. The two-level Meyerland Plaza grocery will have a pharmacy and curbside pickup at street level, with a kosher bakery, a coffee shop, New York style bagels and cheese and meat section upstairs. “There will be a full service seafood section, along with sushi, a large produce section with organics and more than 1,600 wine labels. He and his team met with the Chabad House and Levi Donin on Wednesday to review requirements for Kosher offerings, both in the kosher bakery and throughout the store. The new H-E-B store will have a second-story parking deck, in addition to street-level parking below. Meyerland Plaza has a number of restaurants, banks and big-box retailers including Best Buy and Office Depot. A number of Meyerland citizens had comments. What will happen to the old H-E-B Pantry store on S. Braeswood, which did not re-open after Hurricane Harvey? “We do not own that store, we are merely a tenant of Brixmor so we can’t comment as to its future,” says Lisa Helfman, Director of Real Estate for H-E-B. Bellaire: McClelland said its new 70,000-SF Bellaire store under construction at 5130 Cedar and Bissonnet will open June 28, in time to buy your Fourth of July hot dogs. The two-story project is just west of South Rice. At the Bellaire City Council meeting this week some Bellaire merchants expressed concerned about how the new store will impact parking in Bellaire’s commercial district. Tanglewood: Fidelis Realty has hired HFF to sell its Tanglewood Court, an H-E-B-anchored shopping center on a 12-acre site at the corner of San Felipe and Fountainview. Fidelis developed the fully-leased 125,000-SF retail center, which opened in 2014. HFF’s Rusty Tamlyn, who represented Ed Wulfe in the 1997 sale of Meyerland Plaza, is marketing the Tanglewood Court center for Fidelis.